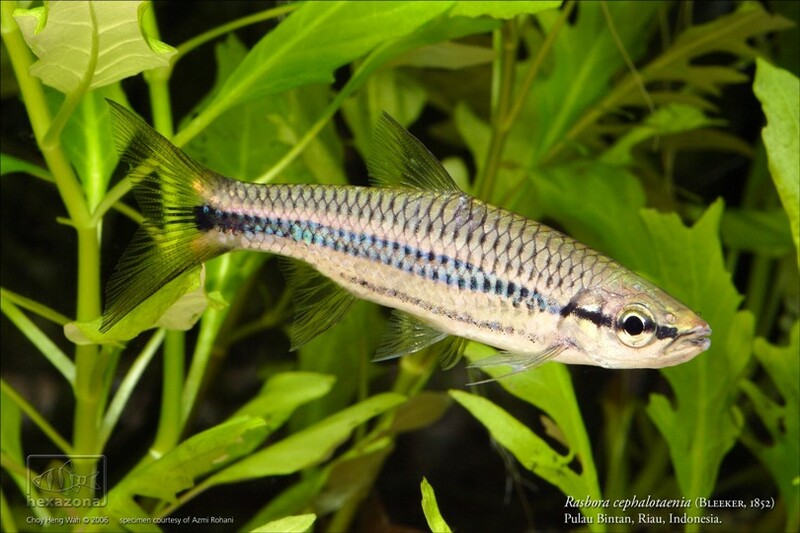 Rasbora cephalotaenia; this specimen was collected from Pulau Bintan (Bintan Island), just south of Singapore. 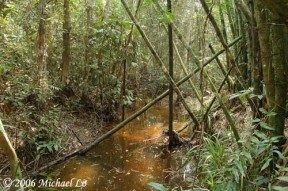 R. cephalotaenia was collected from this blackwater stream in the Sadong swamp forest near Batang Sadong, Sarawak, Borneo. A different specimen of R. cephalotaenia from Bintan Island. 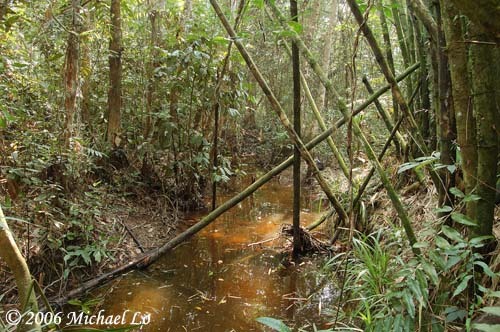 Another collection locality for R. cephalotaenia close to the Mandor River in West Kalimantan (Kalimatan Barat), Borneo. Head detail of R. cephalotaenia. Well-conditioned adult of R. cephalotaenia. It was previously thought restricted to Peninsular Malaysia and the Greater Sunda Islands of Borneo and Sumatra but in 2006 was also collected from a tributary of the Kolok River in Narathiwat Province, southern Thailand. Unfortunately it is now considered extirpated from the island of Singapore where it was once native. Much older records from China are almost certainly a result of misidentification. 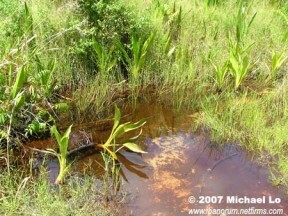 It has been recorded from various parts of Peninsular Malaysia including peat swamps in northern Selangor state, streams just outside Kuantan city in Pahang state and various localities in Johor state; on Sumatra (Indonesia) collections have occured at Taloek in Riau province, the Moesi River close to the city of Palembang in South Sumatra province and Bangka Island just off the southeastern coast; in Malaysian Borneo there exist numerous occurences from Sarawak state most notably from the Baram River; in Brunei Darussalam it can be found inhabiting tributaries of the Belait and Ingei Rivers, Belait District; in Kalimantan (the Indonesian part of the island) localities in the province of Central Kalimantan (Kalimatan Tengah) include the blackwater Sabangau River close to the city of Palangkaraya, a tidal tributary of the Mentaya River and the Ramban River near Sampit; it has also been recorded from a few locations within Western Kalimatan (Kalimantan Barat) province but its range appears not to extend into the far north and east of the island. 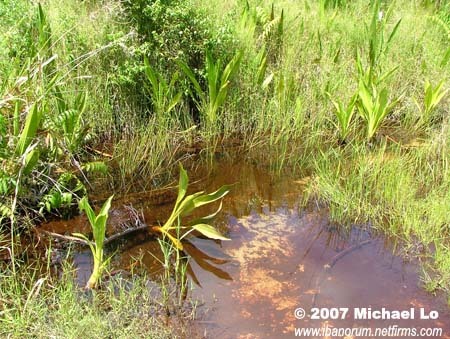 Inhabits black water streams and rivers associated with ancient forest peat swamps. The water is stained brown due to the release of tannins and other chemicals released by decomposing organic matter and the substrate scattered with fallen leaves, twigs and branches. Such environments characteristically contain very soft (negligible hardness), acidic (pH as low as 3.0) water and are often dimly-lit due to the forest canopy above. Across much of Southeast Asia these biotopes are under threat from rubber/palm oil plantations, building developments and other human activities. A large adult can measure 5.2″/13cm..
An active species with a group requiring a tank measuring around 48″ x 18″ x 18″/120cm x 45cm x 45cm/255 litres. 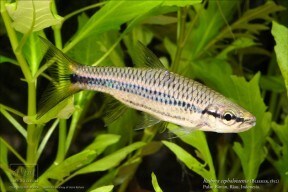 Choice of decor is not as critical as water quality although this species does look particularly effective in a well-planted tank. To see it at its best a biotope-style set-up can also make an interesting project. A soft, sandy substrate is probably the best choice to which can be added a few driftwood roots and branches, placed in such a way that plenty of shady spots are formed. If you can’t find driftwood of the desired shape common beech or oak is safe to use if thoroughly dried and stripped of bark. The addition of dried leaf litter (beech, oak or Ketapang almond leaves are all suitable; we like to use a mixture of all three) would further emphasise the natural feel and as well as offering even more cover for the fish brings with it the growth of microbe colonies as decomposition occurs. These tiny creatures can provide a valuable secondary food source for fry whilst the tannins and other chemicals released by the decaying leaves are thought to be beneficial for blackwater fish species such as this. Certainly R. cephalotaenia is known to display more intense colouration in tannin-stained water. Leaves can be left in the tank to break down fully or removed and replaced every few weeks. pH: Surprisingly adaptable given its natural habitat and is happy within the range 5.0 – 7.5. 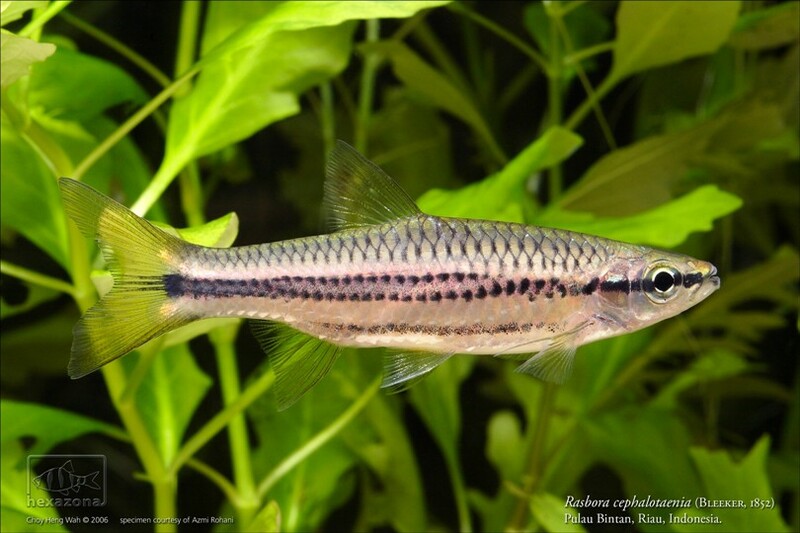 This species makes an ideal addition to a peaceful community of Southeast Asian/Indian species such as other similarly-sized Rasbora, Puntius, botiid loaches and gouramis of the genus Trichogaster. 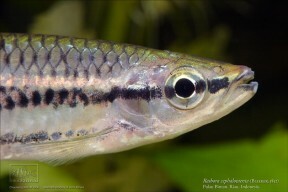 In a biotope set-up you could try it alongside other Malaysian/Bornean blackwater species. 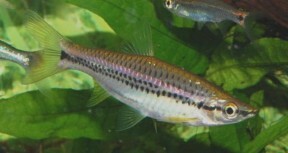 There are many suitable choices but some of the more commonly exported examples include Puntius lineatus, P. pentazona, Trigonopoma gracile, T. pauciperforatum, Rasbora caudimaculata and Pangio (kuhli) loaches. We’re not sure if it has been bred in the hobby although it should certainly be possible. Like most cyprinids this species is an egg-scattering spawner that exhibits no parental care. That is to say when the fish are in good condition they will spawn often and in a densely-planted, mature aquarium it is possible that small numbers of fry may start to appear without human intervention. However if you want to increase the yield of fry a slightly more controlled approach is required and we suggest upscaling an approach that has proven successful for smaller members of the genus. The adult group can still be conditioned together but one or more long, shallow, say 36″ x 12″ x 12″/90cm x 30cm x 30cm/85 litre containers should also be set up and half-filled with water. These should be very dimly lit and the base covered with some kind of mesh of a large enough grade so that the eggs can fall through it but small enough so that the adults cannot reach them. The widely available plastic ‘grass’-type matting can also be used and works very well for other species. The water itself should be of slightly acidic to neutral pH with a temperature towards the upper end of the range suggested above. An internal power filter can be added initially and this should be positioned so that the flow is directed down the full length of the tank. 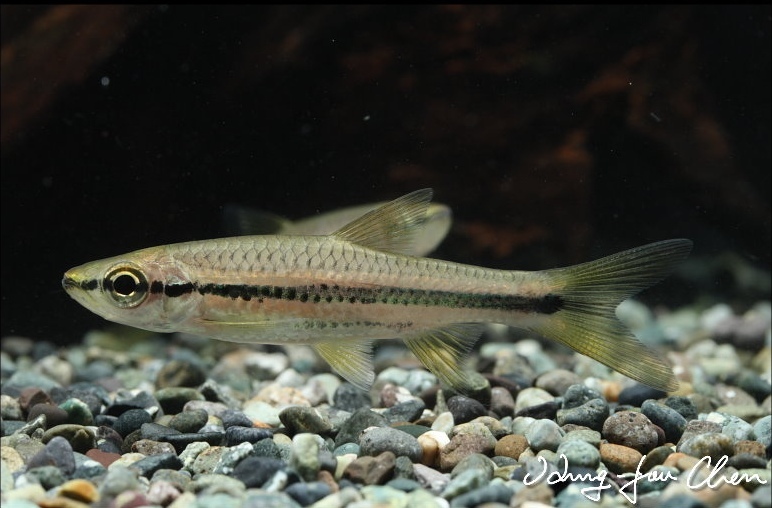 This species is not often exported which is a shame as it makes an elegant, peaceful resident of the larger community tank. 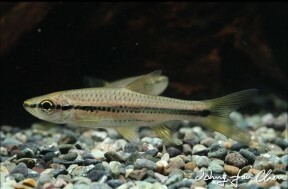 It can be easily distinguished from similar-looking congeners such as R. einthovenii and R. jacobsoni by examining the dark lateral stripe that extends lengthways along the body of the fish as in R. cephalotaenia it is composed of a series of dark spots whereas in the other species it forms a continous solid line.